Roast baby potatoes, roquette, radicchio, asparagus, & smoked almond aioli. 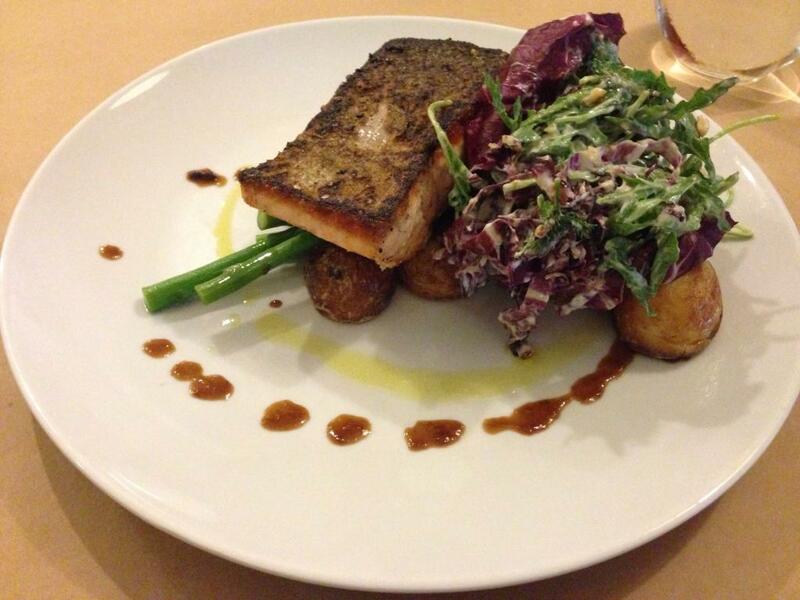 The salmon is soft and pink, and nice and salty. I dip it in some of the dark ring of sauce that rings the plate. It tastes like barbecue sauce, and adds a surprising tang to the salmon. Turns out it's "pear balsamic". The salad has a kind of mayonnaise through it. It's not bitey at all, though. There are pieces of almond throughout it, and a nutty taste pervades this salad. The thick creamy mayonnaise, and the rough lettuce (plus the almonds) make this salad fairly indelicate and slightly bland, but it's slightly interesting nonetheless. 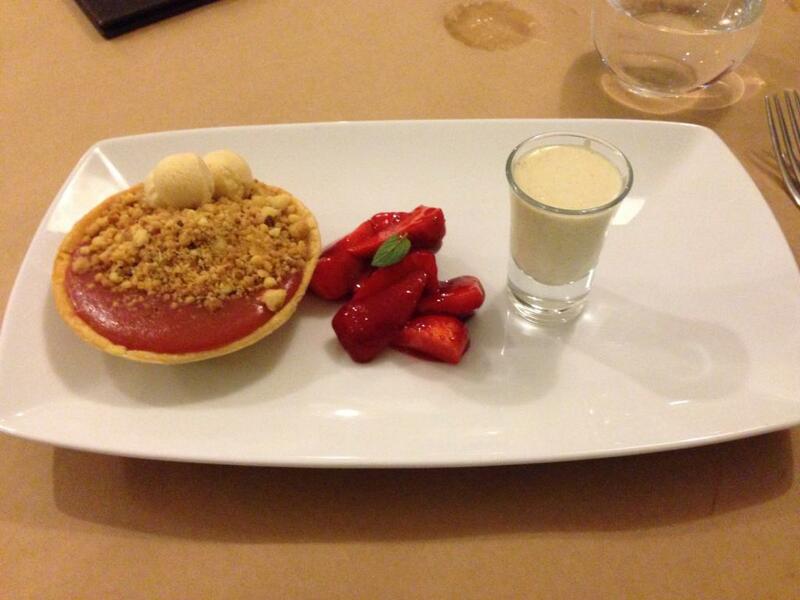 Crumble, glazed strawberry & vanilla Galliano cream. "Are you a food blogger?" the waitress asks. "I read your blog a few weeks ago." I pour the vanilla Galliano cream over the tart, and dig in. The tart's wall is crispy filo-like pastry. I cut through it, and the runny innards of the tart flood out. The crumbs are crunchy and tasty, but the rhubarb in the pie doesn't have a particularly strong flavour. I really wanted more ice cream here. The cream wasn't stribg enough in texture or taste, and it effectively disappeared when I poured it from its cup. I'm not sure what to make of the strawberries. Desserts often contain an irrelevant fruit component, and this one is coated in a raspberry sauce that tastes a bit like raspberry jelly. Parking. Can park in suburbs, south of Jetty Rd.